Jafet Ramirez is building a house with bricks he made himself. He cannont afford to put a roof on it. LifeNets helped with a $275 grant to finish the job. 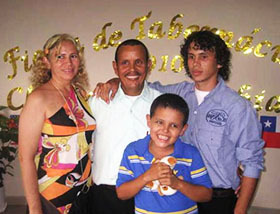 On the right is a picture of Jafet Ramirez with his wife Ladaine, and their two sons. In a little town in the interior of Colombia that you can't even find on Google Earth, is the thriving little church of Santa Rosa del Sur. It cannot be reached by highways, so you must come by boat or a tiny 4-seater plane that lands in a field. Three of the fathers work at the radio station, one is retired, two are schoolteachers, and one works in construction, named Jafet Ramirez. While renting a small home, he has bought a lot in town and has been busy making all the bricks for their new home. When there is no construction job to be had, he works at other projects, such as digging sewers in their growing town. He has located a metal roof he can purchase second-hand for half the price of a new one, but needs help scaring up the $275 to buy this roof for their new house. They have been married for 20 years and have two sons, one of whom is now studying music in the capital, Bogota Jafet has carefully built the walls of his new home and needs our help to put a metal roof over it to have a place of their own. While in Colombia in November / December 2010 I lived three/four days with the families in Santa Rosa, Colombia. They were all wonderful. We cemented our bonds. At the hovel that Jafet presently rents, I got shocked touching electric outlets dangling from a wire hanging from the ceiling. One of his nearby friends members knows how to ground wires, and I am hoping will help Jafet when he gets to that stage of his housebuilding. The poorest of the whole church there is Jafet. The whole group moved there from another town years ago when Leonardo was offered a job as the radio announcer for the local station. The clan all moved and got jobs. Jafet married the daughter, and has laboured diligently to support them. Except for weekends, this little church gathers every evening for a Bible Study with the correspondence course, led by Claudio Sierra, usually.